…for the mountains of the mighty Mont Blanc Massif. Past guests Chiao-Ling, Elaine and Peter sent us this photo from last year’s Tour du Mont Blanc. 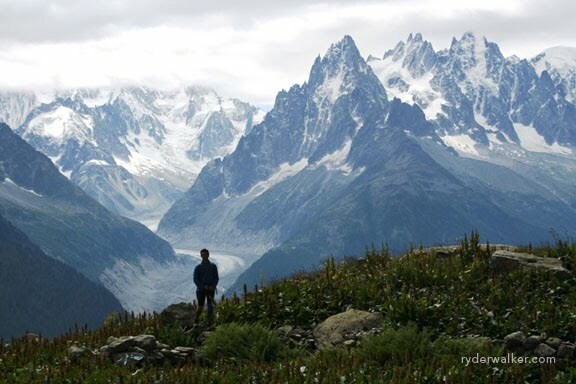 This is a view from the Grand Balcon Sud, a world renowned hiking trail above Chamonix, France. The Grand Balcon Sud rewards travelers with unobstructed views of Mont Blanc and her towering sentinels. The three jagged peaks to the right are called the Aiguilles de Chamonix. (The needles of Chamonix). In order from left to right are the Aiguille du Grépon, Aig. du Plan and Aig. du Midi. The sinuous glacier, snaking its way through the background, is called the Mer de Glace. (The Sea of Ice). On a sunny day, Mont Blanc sparkles above all the rest.